If you are wondering if it is worth mining Ethereum you can get an idea on how much Ether (ETH) should be mined with a specific hashrate depending on what hardware you have available with a simple mining profitability calculator. All you have to enter is the hashrate you are getting (you can run ethminer in benchmark mode to see what hashrate to expect from your CPU or GPU if you have not yet started mining) and you will get information about the expected mined amount in ETH and USD. The calculator uses up to date data from etherchain’s API to get fresh information about the Network Hashrate, average Blocktime and 1 ETH price, so it should be pretty accurate with the results at the moment of time you use it. The estimated coins to be mined and their USD value are shown for a period of 1 Minute, 1 Hour, 1 Day, 1 Week and 1 Month, though the longer the period is the less accurate the estimation could be. So for example if we have a single AMD Radeon R9 280X GPU available that is capable of producing around 24 MHS worth of hashrate when mining Ethereum and we enter that value in the calculator we are going to get an estimation of about 4.5 ETH mined in a day or a bit over $5 USD. This is making mining Ether on the Ethereum network a pretty good and profitable crypto currency to mine at the moment if the estimates are true. If you want you can check our Quick Guide on How to Mine Ethereum on Windows to get things started. 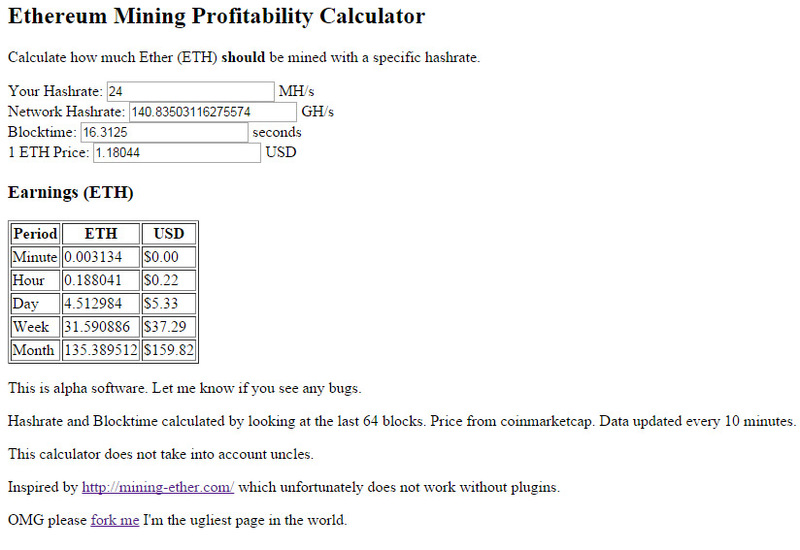 The Ethereum Mining Profitability Calculator is pretty simple and dubbed as alpha software, but it works well, the code is written in Python and the source code is also available for anyone interested.